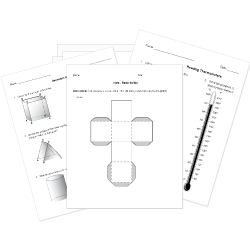 Check out our pre-made Geometry worksheets! You are browsing Grade 8 questions. View questions in All Grades. You can create printable tests and worksheets from these Grade 8 Angles questions! Select one or more questions using the checkboxes above each question. Then click the add selected questions to a test button before moving to another page. In the figure, if angle 1 is [math]100deg[/math], what is the measure of angle 5? Find the measure of one angle of the following polygon. Lines m and k are parallel, with angle 7 measuring 100 degrees. Find the measure of angle 3 in degrees. Find the measure of one angle of a regular 20-gon. Find the measure of one angle of a regular decagon. Given a polygon with angle measures [math]100deg[/math], [math]105deg[/math], and [math]130deg[/math], there is one more angle. What is the measure of the last angle? Find the measure of one angle of a regular dodecagon. In triangle ABC, which is an angle included by AB and AC? In triangle ABC, which is an angle included by the pair of sides BC and CA? In triangle ABC, name the side included by the pair of angles [math]angA and angB[/math]. The measures of the exterior angles of a polygon total [math]360deg[/math]. The angle that is formed by the intersection of the line segments of a polygon is called a vertex angle . A hexagon has angles of measures 95 degrees, 65 degrees, 140 degrees, 145 degrees, and 150 degrees. What is the measure of the missing angle? What is the sum of the measures of the angles in this polygon? 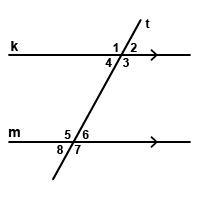 Consecutive angles share a side. An angle bisector divides an angle into two equal pieces. 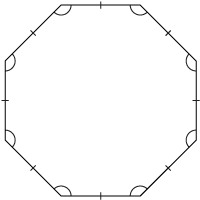 The measure of one angle of a regular 100-gon is [math]176.4deg[/math]. Angle ABC is congruent to Angle CBD. In triangle ABC, AB is included by [math]angA and angC[/math].